The Valley Library 4th floor Rotunda will serve as the basis of operations. Light refreshments will be available for participants. View book titles on this page. REGISTRATION is now closed, but you can drop by to read a book that might be available! 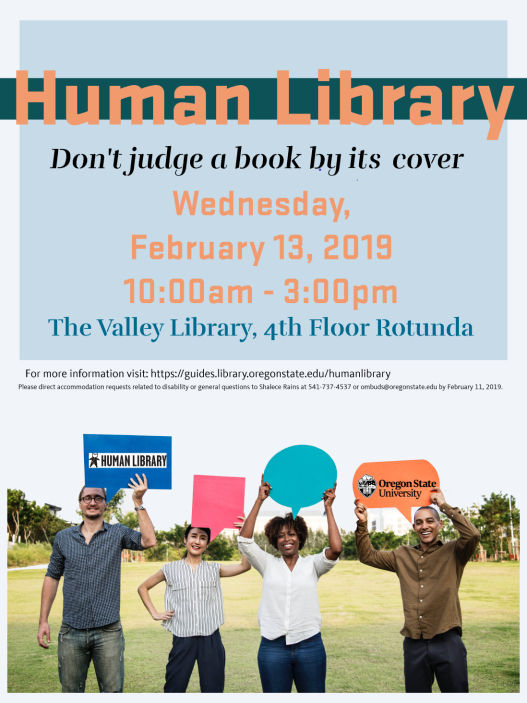 A human library functions similarly to a regular library; however, the books are real human beings, who teach others about themselves and their experiences through interpersonal dialogue. Experiencing a discussion with a human book creates an opportunity for constructive interpersonal dialogue and learning between people who may normally not interact. People who volunteer to participate as books in Human Libraries represent various cultures and identities, may have experienced or witnessed social exclusion or indifference at some time in their lives, or are those who have participated in unique life experiences. The Human Library offers a comfortable environment for diverse people to meet, ask questions, and learn from each other. Participants who wish to have a two way, interpersonal discussion with a Human Book can schedule a 30-45 minute session with a specific Book or register at the library on the day of the event. Pre-registration is strongly encouraged. “Librarians” (representatives from the coordinating committee) will be on site to assure scheduling goes smoothly, and Books are returned in good condition. Light refreshments will be available.